Sunbrella Performance and Outdoor Fabrics: a household name that stands for quality and function. They look and feel soft like indoor textiles, but their revolutionary construction allows them to be used indoors and out. 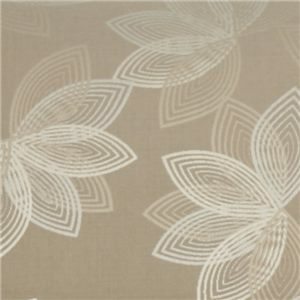 Sunbrella fabrics are fade-resistant and UV proof, stain-resistant, and water-resistant. You can even clean them yourself using household cleaners! They are able to withstand the heaviest treatment from kids and pets. Put a chic twist on a traditional loveseat with this lady-like settee. The contemporary piece features sloped track arms for subtle sleekness, complemented by the tapered wood legs. A continuous box edge style seat ensures comfort, while a variety of custom upholstery options allows you to pick the perfect color or print for your home. The Connick Contemporary Settee with Sloped Track Arms by Bauhaus at Colder's Furniture and Appliance in the Milwaukee, West Allis, Oak Creek, Delafield, Grafton, and Waukesha, WI area. Product availability may vary. Contact us for the most current availability on this product. Padding & Ergonomics Sinuous Seating System with Tempered Steel Springs Which are Clipped and Braced with a Plastic Coated Wire That Increases Strength for Improved Seating. 5 Inch Coil Insert Inside a Premium 1.8 lb. Density Polyurethane Foam Wrapped with 2.25 Ounce per sq. ft. Layers of Thermally Bonded Polyester Fiber Laminated to the Foam Core. Fully Padded Outside Arms and Outside Backs. A chic take on contemporary decor, the Connick collection mixes elements of traditional design with modern polish for a truly sophisticated look. Sloped track arms, tufting elements, and tapered feet elevate each piece in this seating collection. 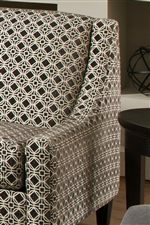 A variety of fabric options allows you to choose the perfect look for your home, whether you want neutral tones or a bold print for the accent swivel chair. Capture the refined look of classic decor with the updated pieces from the Connick collection. The Connick collection is a great option if you are looking for furniture in the Milwaukee, West Allis, Oak Creek, Delafield, Grafton, and Waukesha, WI area. Browse other items in the Connick collection from Colder's Furniture and Appliance in the Milwaukee, West Allis, Oak Creek, Delafield, Grafton, and Waukesha, WI area.